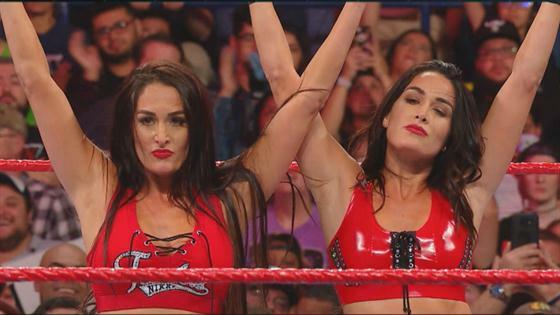 On Sunday's all-new Total Bellas, Nikki Bella and Brie Bella joined their female peers at the first ever all-women's pay-per-view, called Evolution. Understandably, as Nikki was in the main event against Ronda Rousey, she was eager to commemorate the historic WWE match. Sadly, Brie wasn't feeling the same way as she was worrying about life after retirement. "I just can't wait for next week to come because it's gonna be, all of a sudden, normal life. Like, being with Birdie every day," Brie noted to her sister. "And it makes me excited to move to Phoenix just to know that I'll have more stability and that things will just feel a little more normal." However, since Brie wasn't retired just yet, Nikki hoped her sister would be a little more present ahead of Evolution. "I feel like my sister's already checked out and I want her to feel as a part of this, because I wouldn't be in the position I am without Brie," Nikki relayed later on. "This is, honestly, the biggest week of our careers ever. She should be so excited!" Thus, the single Bella twin decided to plan an epic pep rally to celebrate all they've accomplished in their extensive wrestling careers. Of course, amid the ongoing criticism about her comeback, Brie found herself criticizing Nikki's plan. "I do think it's great that you want to do something for the Bella Army," Brie informed Nikki at dinner. "I just don't think you can make a pep rally happen. I'm sorry." Despite being shocked by Brie's "Debbie Downer" ways, Nikki decided to move forward with her pep rally plans. With the help of an event planner, John Cena's ex planned the "most perfect, movie-feel, high-school, colorful pep rally you could ever imagine." "Walking into the gymnasium, I am like, 'This pep rally looks perfect!'" Nikki admitted to the Total Bellas camera. "This is exactly what I wanted." We're talking cheerleaders, mascots and a surprise appearance by Total Divas costar Paige. "I hope this pep rally helps Brie remember how amazing it is to be a part of the Bella Army, the Bellalution, the Bella Twins," Nikki continued. "It's not just me walking in to Evolution, it's the Bella Twins walking in to Evolution. That we created this together!" Yet, was it enough to put a pep back into Brie's step? The answer? Yes! With the encouragement of her adoring Bella Army, Brie was able to tell her story and address the "botched Bella" criticism. "They made this mom feel that, in her new body and her new way of life, I couldn't get back in that ring," Daniel Bryan's wife noted to the crowd about internet trolls. "It was all of you that made me feel that, no, the ring is where I belong." In fact, the pep rally helped Brie realize that she'll always have her Bella Army—even when she's "60 with my wine." Regardless, things took a tense turn heading into the sold-out Evolution. Not only was the pay-per-view event compared to Wrestlemania, but many were betting on Ronda to come out on top. "I was chosen to be the headliner, the main event to represent the women worldwide," the Total Bellas star stated in a confessional. "I don't want to fail WWE and I certainly don't want to fail the women." With Brie by her side, Nikki certainly held her own against the Raw Women's Champion. Although, was it enough to win the title? For that answer, be sure to check out the Total Bellas season 4 finale Sunday, Mar. 24 at 9 p.m.
See everything else that went down on this week's episode in the recap video above!